Mein kup runneth ober mit Julie! We're In the Dark again! Hi Julie and Upside-Down Bats! Started off metal...and STAYING metal tonight!! Sadly more rare nowadays, but NEVER forgetting! I make like a Pigeon and AR! Hey P-90! P-90 and Matt From Springfield. Glad to see some members of the comments board "A Team". I always enjoy the CS Team too! Glad to see you here! ...but so do Meghan and Julie nowadays. I've enjoyed the relatively frequent Julie appearances on fill-ins. Julie is this month’s Bill Mac as far as fill-ins go. And hey! That’s a nice thing! How anti-establishment 80s of this music! Evening Jake! I would say Julie is becoming a Todd-O-Phonic fill-in, but he's on the main schedule now! It's nice to listen Julie! :D Thanks for bringing in the Dark Night magic again! Love the minimal wave synth of Void Vision. The humans do not compute. Ohhhh Dark Night dance party! don't forget guys, still raising money to keep us afloat! hehe hey meghan, yeah for now it is. Want I should lock Stan up so you can do 3am? "Dance in the Dark" with us, Meghan! All the dark awesomeness with half the sleep deprivation. @CS: That does not compute..! Then again, neither do I without my crutch, er, machinery. And yes! Midnight is a great time slot - still so dark and quiet, not too late! That's the joys of fill ins.... Better hours! Though the hard part of fill ins is fundraising..... Help a sistah out! @Tome: That's what I was thinking...only this version would be for the robotic Drew. Wow. This “Five O’Clock World” cover is so weird. @CS: You know I may have been thinking of that subconsciously! Similar themes, now in similar styles. Nice transition with The Human League, Julie. @Matt Ya, that makes sense. Technically since this is before 3:00am, this is a “Dark Evening of the Soul” right? @Julie: Compared to 3:00am being night, right? Prime Time of the Soul, on WFMU 91! Playing all your favorite stax of wax! Yes the Vogues - and yes, Drew Carey! Wait, are there people who DON'T follow weird TV shows? @Ike: Those people are weird. Let's make a TV show about them! Everyone will yield to Sabbath eventually. Time to cleanse the palate. METS WIN! LOOK OUT CUBS!!! Even if Mr. Robot hadn't turned out to be good, I would've been impressed that somebody did a TV drama about something other than crime-fighters, spies, doctors, or lawyers. I just heard a good remix of Shirley Bassey's version of this song!
" "If You Go Away" is an adaptation of the 1959 Jacques Brel song "Ne me quitte pas" with English lyrics by Rod McKuen." Seasons In The Sun was also a Rod McKuen translation of Brel. Someone very smart who knew a lot about music once told me, if you put a Neil Diamond record on at a party, a lot of people are going to make casually deprecating remarks when the song starts, because Neil isn't "cool." But then, for the rest of the song, the same people just get real quiet, conversation stops in the room-- because everyone is LISTENING, including the ones who had to say something snarky at first....you know? @P-90: Same thing with Steely Dan. Also, if you are Jewish on any level and you grow up in NYC you will be listening to tons of Neil Diamond and Billy Joel whether you want to or not. Also, I found out in college that all of the orthodox kids consider Steely Dan to be really “out there”… It’s like Orthodox New Wave to listen to Steely Dan. Live at the Greek is a classic. Back in my youth I used to tune in a lot of commercial radio and for a time that included Neil Diamond. Now I just can't really listen to that stuff anymore. Now I'm lookng for what I haven't heard. @P-90: No wrongs I agree! - EFD also agrees! The awards show that brought her to sing "Goldfinger" recently also agrees! 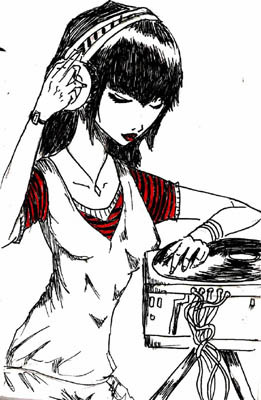 "re-mixable/mash-uppable", her voice itself has that je-ne-sais-quoi *rhythm* about it - it fits into different mixes well! So glad to hear your fill-in tonight! thank you Summer & Michael! "Yeah! Modern music! Secular! The Dan guys aren't even Orthodox!" Kind of like the old Catholic cardinal some years back who talked of the "demonic" influence in rock music from bands like The Eagles! ..Actually, that was prob worse! CS: of course a lot of that stuff that used to be on commercial radio was great. But they played it all to DEATH, and we're all here at 91.1 looking for what we haven't heard, or at least not heard as much. Steely Dan a great example: that band in its heyday had a lot of qualities that FMU DJ's and listeners would tend put a great deal of value on: musicianship, originality, inspired arrangement/production etc. But its one of they're favorite bands to hate on now and belittle. Because of the crushing overexposure for a couple of decades, a lot of people just can't listen to any of it any more. Ditto Fleetwood Mac and a slew of others. @P-90 Yes. Used to listen to classic rock, oldies when they played do-wop, country, easy listening, 80s music. All played to death and I just can't listen to even the songs I liked for very long. A Place Both Wonderful and Strange - gotta love these band/song/album titles you find! Nothing hurts my ears more than when I catch mainstream music on the PA system of a store or restaurant and can't get away. I was just telling a friend that tuning into college / community radio is more intimate and requires you to be an active listener in order to track down all the obscure music. "Coct 2 Twin Spins! So nice x nice, we played it twice x twice"!! I'm having a really good time, are you guys having a good time? @Julie: Solicit vacation info from back-to-back DJs! Hell, trick them into both going on a 6 hour boat ride if need be and fill-in together with Meghan! @Julie: I should go to bed but your music choices are too enjoyable. Glad I have off from work tomorrow! Keep on drifting into the 1980s! good evening Julie and listeners! Having a good time. Thanks for filling in tonight! Don't often have a chance to hear the Dark Night of the Soul! Speaking of The Cure, I remember watching the video Staring at the Sea (I think that's what it's called) back in the mid '80s. It's a compilation of The Cure videos in chronological order. It's pretty fun to watch the transformation/progression of Robert Smith's hairstyle. Last Night I Dreamt That Somebody Loved Me - always thought of this intro as unusual. Ah, "crowd noises from the miners' strike"
That kid was ahead of his time. HA! That is great Julie! And, PERFECT follow up C.S.! 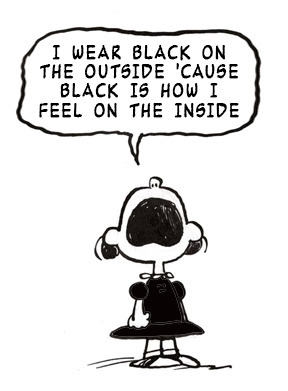 now i am wondering if Charlie Brown's *angst* was somehow inspirational to The Smiths! and so many others, come to think of it . . . so alone, so young, so tragic! . . . WAY ahead of his time! Laura Nyro, another singer I think can do no wrong. Even when her lyrics aren't the best...my God, how she SINGS them! She IS soul! @ C.S. -- excellent, EXACTLY! 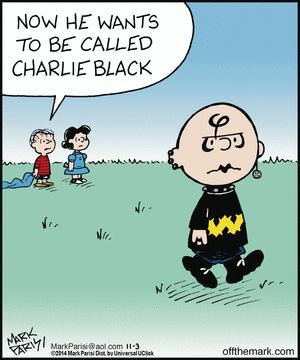 @slugluv: "Peanuts" was called by some critic to be both the first modern, and first post-modern comic. Yes, I think "West End" shows for London. Tottenham Court Road, Regent Street etc. Got to go. Catch the rest on the archives. Great show as always, Julie. Fun talking with everyone on the comments board, too. Goodnight all. If I haven't heard it, it's new to me! All of the Bottomless 80s Pit has been great tonight. Toy piano! And Dresden, I've been there! PERFECT! ABBA sliding into JIM CARROLL! Man, this beams me right back to 1980 or whenever it was. 1981? thanks Matt so am I! I don't want to go! Where the Hell did the three hours go?! thanks for listening guys! Be back Nov 24th in Irene's slot! WHAT? Julie that's more than a whole month!!!! Is that Thanksgiving, or 2 days before or something...? THANKS Julie! Always a pleazh to listen to Dark Night of the Soul! Thanks everyone who joined us tonight! Good Dark Night of the Soul! Have a great - Friday - everyone! @Julie have a delicious Halloween!